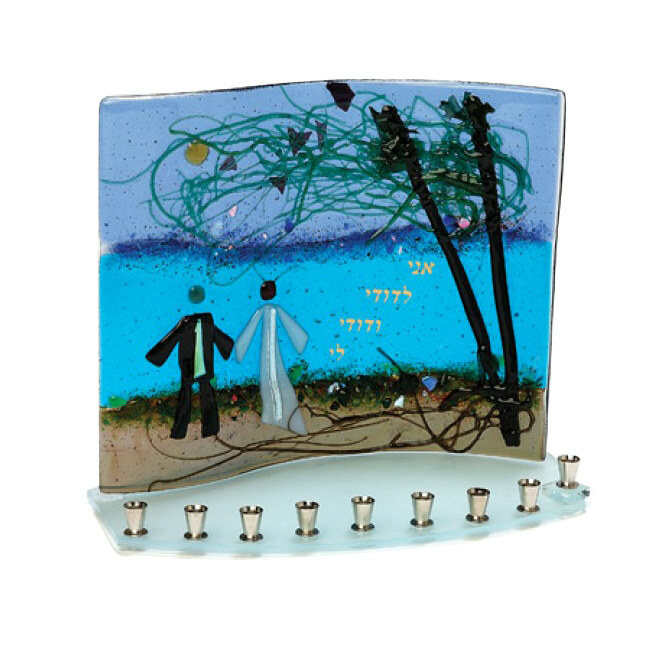 A Tree of Life Wedding Menorah, Handmade by The Tamara Baskin Art Glass, Makes A Beautiful Wedding Or Anniversary Gift. The Artist Writes "In The Torah, The Tree Symbolizes The Jewish People. The Roots Are Our Ancestors, The Trunk Corresponds To The People Of Israel Who Were Redeemed From Egypt, The Branches Represent The Tribes Of Israel, And The Fruit Of The Tree Are The Good Deeds Performed By Each Jewish Soul." What A Wonderful Sentiment This Menorah Was Created With! Each Menorah Is Handcrafted, No Two Are Exactly Alike. The Menorah Is 8'' Tall x 10'' Wide.